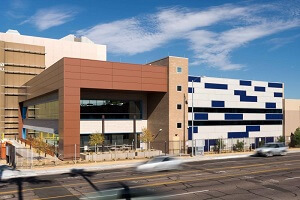 Tempe based Green Ideas Building Science Consultants is excited to announce the certification of the PayPal Epsilon Data Center Expansion Project! The project demonstrates PayPal’s commitment to sustainable, employee-centric and energy efficient business operations. The addition is a 25,600 SF, two story mixed use building comprised of office and warehouse space. Located on the existing EBay/PayPal campus in the urban context of midtown Phoenix, employees have close access to alternative forms of transportation, including bus lines and the light rail, as well as restaurants and other services. Bike racks and showers have been installed, encouraging employees to cycle to and from work and reduce automobile traffic. Other features favorable to employees include improved indoor air quality, preferred carpool parking and electric vehicle charging stations. LED lights have also been installed with dual sensor controls to save energy, yet give employees control over their micro-climates. Thermostats in private offices and work areas have also been located to give employees additional control. Designed by Ajanta Design and constructed by Hardison Downey Construction, the data center expansion is a showcase of sustainable design in the context of our urban desert. Responsible construction methods include recycling 80% of construction waste, specifying materials with recycled content and giving preference to regionally sourced and manufactured materials. As a result of this strategy, the facility earned 51 of the available points in the LEED for New Construction Rating System, achieving the Silver level status. Green Ideas’ President Charlie Popeck stated upon achieving certification, “It was exciting to have worked with PayPal and Ajanta Design on this important expansion project. The organization’s belief in sustainable business operations and the employee experience demonstrates their position as a forward-thinking, industry-leading organization”. Established in 2002, Green Ideas is a full service building science consulting firm offering high-performance building consulting, 3D energy and daylight modeling, building information modeling (BIM) implementation, building commissioning, and world-class green building consulting services. The firm is designated as a LEED™ Proven Provider by the Green Business Certification Institute and is an industry leader specializing in LEED (Leadership in Energy and Environmental Design) consulting including charrette facilitation and certification services. Its clients are building owners, architects, engineers, contractors, real estate developers and facility managers as well as corporate entities wishing to establish business advantages through sustainable practices. With a vision as bold as the results they achieve, Green Ideas is dedicated to transforming the market by promoting building science through a “triple bottom line” approach to business operations.